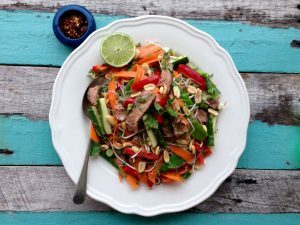 Thai Beef Salad is fresh, full of flavour and works just as well for lunch, dinner or an afternoon snack. It’s the ultimate crowd pleaser in the warmer months. ; it’s the dressing that makes it amazing. Experiment with different veggies and salad ingredients as well as different proteins. Steaks: Heat a frying pan over medium-high heat. Season steaks with salt and oil and cook for 3 mins per side (or until done to your liking- medium works well for this). Remove steaks from pan and leave them to cool. When cool, slice thinly and mix with a little of the dressing until needed. Noodles: Place noodles in a bowl and cover with boiling water for 5 minutes. Drain and rinse with cold water. Greens: Trim asparagus and snow peas then place in a bowl and cover with boiling water for 2 minutes. Drain and immerse in cold water until ready for use. Carrot: With a veggie peeler or spiral veggie pasta maker create strips of carrot. If using zucchini do the same with the zucchini. Capsicum & Cucumber: Slice capsicum into strips, cucumber into batons. Chop spring onions, coriander and mint finely. Dressing: Place all ingredients in a jar and shake. Assembly: Place meat, noodles, veggies and herbs in a bowl and toss with the 2/3 of the dressing. Top with nuts and extra coriander. Serve with the remaining dressing on the side. Optional: serve with fresh lime wedges, fresh or dried chilli and the remainder of the dressing. If taking to a BBQ or prepping the day before, keep the prepped veggies, dressing, cooked/cooled noodles, steak and peanuts in separate containers and mix together at the last minute. This way everything retains its freshness and crunchiness. 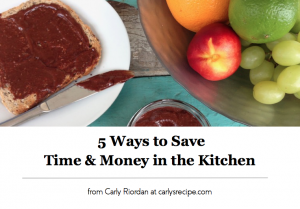 This recipe yields a large amount. If you are making a dinner for two, you could use half the quantities. However, I find that it is so yummy for lunch the next day that a large batch suits me just fine. Experiment with different salad ingredients and veggies. Blanch any greens (peas, broccoli, beans, asparagus, snow peas) by pouring boiling water over them and leaving for 2-5 minutes (depending on size) then run them under cold water to refresh. Even the most basic salad will come alive with the Thai dressing. Swap the steak for chicken breast, prawns, fish or tofu. For a more filling meal double the amount of noodles or protein used.